"I NEED YOUR HELP, BROTHER...."
responsibility for a herd of goats? You are a deacon, visiting the saints, and teaching a Sunday School class, but the pastor is just convinced God wants you to help in the day school or the home schooling program. In that program are many unsaved people or kids who show no interest in the Gospel, but the pastor and staff bury themselves in the thing with some vague hope of "fruit some day." They may even have a couple of people to talk about who got saved through this program. The fact that God, in his mercy, saved souls is NOT proof he approves of the method. Long after Samson took the honey from the dead carcass of the lion, the Holy Spirit was still empowering Samson to destroy Philistines. But, Samson was a law breaker and out of God's will. The work of the church, and the saints, is to edify one another. 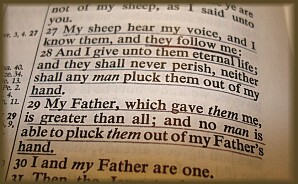 The picture in the New Testament is of saints preaching the Gospel for sure. But, once the local church was established, Timothy, Paul, and the other Apostles give the most attention to feeding sheep. If you are being asked to take a goat herd, and you already have your hands full with a vocation, a family, and the small herd of sheep God has given you, DO NOT allow a goat hugging pastor draw you into another load of work. You will destroy your home, and the sheep will fall into second place. When Satan cannot get people to stay home from Wednesday evening activities, he will inspire the pastor to drop the prayer time and do special Bible studies or Awana programs. Anything to get the saints off of their knees. The same applies to his strategy to destroy the joy and the health of the sheep. If he cannot destroy sheep by convincing shepherds to teach heresy and use wrong bibles, he will convince the pastor and the sheep teachers to run after goats-- needy goats, suffering goats, bleating goats, goats who might get saved if we bury our lives in them. Many a church, and many a marriage, has been destroyed as pastors virtually forced faithful men and women into goat herding. 2. Leave and find new fellowship. The sorrow of leaving, or the mess of driving off an hireling, is infinitely smaller than the cost of getting a letter from your wife's attorney telling you she is divorcing you, OR, being told by one of your kids that they are fed up with church and joining the Marines. Many a teen age girl has gone to bed with a scum ball and gotten pregnant in order to get her Daddy to show her some attention again. Goats or sheep, friend, which will get your whole attention? I will tell you something that is about 90% predictable. If you decline to take the care of a herd of goats for a pastor, he will push you to the bottom of the pile. You will feel the sting of his wrath during sermons, and he will have a strained and pitiful look and manner toward you at church dinners. You will realize you are destroying his peace, and you will, if you are a sucker for jack boot preachers, feel more and more guilt. This pastor will make you the omega of the men of the church. Every wolf pack has an alpha and an omega. 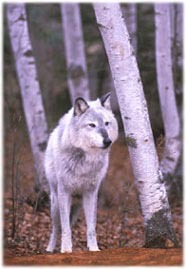 The alpha controls the pack and set an order downline of each wolf. The alpha male has an alpha female, and she enforces the alpha's power and force downline also. The alpha female in this evil structure is the pastor's wife. She may assign "ministries" to other ladies, but the alpha female will never let go of control on behalf of her husband, the alpha wolf pastor. Pay attention-- There is NO New Testament pattern to justify this. There is NO indication that some other older lady cannot be responisble for the ladies' fellowships of the local church. If you refuse to manage a goat herd, you will soon find you are the omega wolf of the pack. You will be shouldered out of what little ministry you have by other wolves who are kissing up to the pastor, the alpha wolf. Your wife will be subjected to belittlement as a form of punishment to you. Your kids may even be omega kids after the pastor's kids get done with them. The Body of Christ is not supposed to behave like a wolf pack. Are you getting the message? Sometimes you have to know when to walk away, and I am not talking about the country song where you walk away from a poker game. You need to walk away from a jack boot wolf who has NO inhibitions in destroying your mind and soul in order to force you into his mold. God will honor a man who removes his family from devilish mob rule.